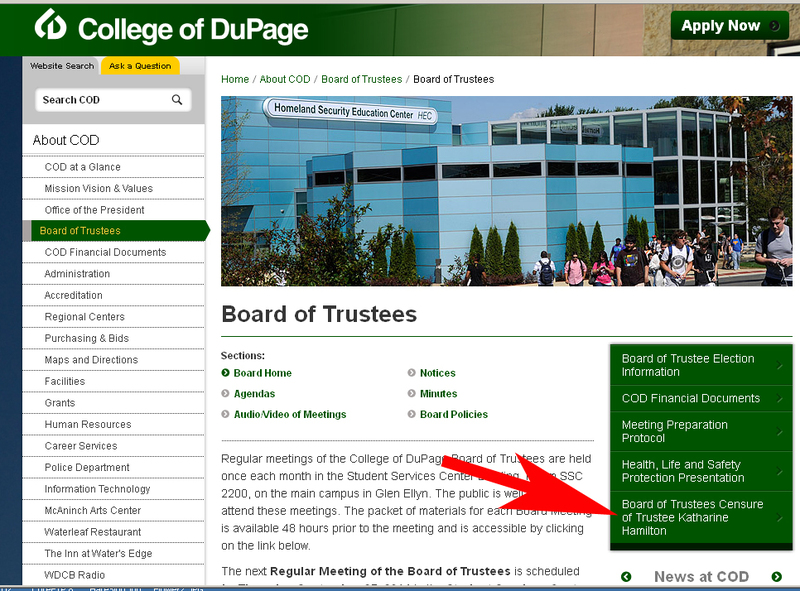 In an unprecedented move that adults do not make, Erin Birt, Chairman of the College of DuPage Board of Trustees, has continued jabbing fellow trustees in the back by placing the illegal censure on the Board’s main webpage. Looking at that page, it is the only resolution with its own link and it is clear Erin Birt is delving into intimidation, bullying, and further acts of revenge upon an elected trustee that spoke out against actions of the college and the board that she did not agree with. The actions of Birt, put on public display during the September board meeting. were an embarrassment to the college. Purposely marginalizing a trustee by cutting her off in the middle of discussions, ignoring her comments, and whispering to others when she is speaking. She adds to that embarrassment by placing this resolution on the webpage. These are all acts of a desperate person trying to assert her perceived power. It all points to the petty personal agenda of the chairman and further erodes public trust. The typical bully. This is clearly an example of Erin Birt, a public official, taking action against someone with the intent of chilling the right of freedom of speech and chilling the right of representing constituents. View a picture of the page (here). Sounds to me like there needs to be a house cleaning at the COD. These people need to be accountable for all of their actions. The next election of board members needs to be one with themessage we will not tolerate inapropriate behavior from our college board members. There does need to be a general housecleaning. I admire the courage of Trustee Hamilton in refusing to abandon her responsibilities to the public that elected her. I cannot say the same for Chair Birt who use her position on the BoT to wage her petty squabble with Hamilton, wasting the the taxpayers time and money. But even the remaining Trustees are too frightened to intervene. A simple motion by Hamilton to retain the Public Comments section of the meeting at the start could not even evoke a second to bring the motion to discussion. I don’t know what possessed the BoT to elect this spoiled little brat to the Chair. I hope the Trustees come to their senses when her term as Chairman is up next year.